We always look forward to new pieces by Lene, and appreciate how she manages to capture the hidden beauty or interesting aspect of even the most ordinary of events or objects in her work. We also love that she sometimes creates her pieces by incorporating unusual materials, often re-cycled. Here is a little more about Lene, what she does and how she goes about creating her art. Happy reading! I’m originally from Denmark, but spent most of my childhood in Belgium. In 1995 I moved to England to study Graphic design at London College of Printing (which is now London College of Communication). When I finished, I realised quite quickly that I didn’t want to work in an office, so started doing graphic art instead and haven’t looked back. I think my sister, Tine Bladbjerg, has inspired me a lot. She’s a jeweller designer and for many years, we shared a studio, until she moved out last year to open a shop. I started out doing arts and craft shows with her. Growing up in Brussels, I think it was probably Magritte. As I child, I really liked his ‘illustrative’ style and think it probably still influences me. He came from a graphic background too. I find inspiration everywhere. Anything can inspire me. Things that make me smile, things I hear or a simple thing as a flower or a tree. I always have a sketchbook with me that I write or draw ideas in and bring my camera everywhere. I often get inspiration when I’m travelling. I go back to my sketchbooks a lot when looking for inspiration for new pictures. 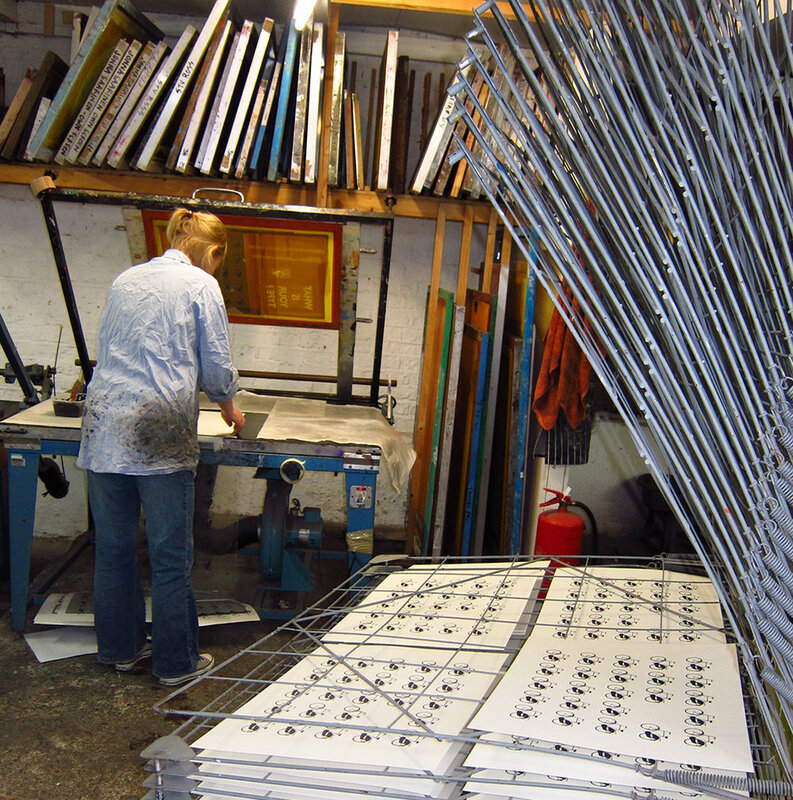 I’m in my studio 3 days a week and 1 day in a printing studio. I love buying art! I do a lot of art fairs where I meet other artists, so like collecting their work. I think the last piece of art I bought was by a swedish illustrator, Staffan Gnosspelius, who lives in London. I have several of his pieces. The style is so different to mine, but I love it. I love gold and for years I’ve been trying to find a gold paint I could print with, that didn’t stick to the screen and I was very excited last year, when I found one. So I have done a series of gold prints; ‘Where flowers bloom’, ‘Chinese Whispers’, ‘Spring Fever’. They are all inspired by nature, which influences me a lot in my work. Thanks for reading about me! You can see more behind the scenes pictures and what inspires me on my instagram Lene Bladbjerg.